At one point or another, most working adults have definitely thought – ‘I cannot wait to retire!’, probably whilst sleepily turning off a 6am alarm clock, or waiting for a delayed train in the freezing cold. Previous generations dreaded growing old, however the modern 65 year old is healthier and happier than their predecessors, so retirement is definitely something to look forward to. This has been proven by a recent survey conducted by YouGov on behalf of Centra, which questioned 2,000 65+ year olds to find out what they were planning to do with their retirement, and what they were most looking for to from their new found freedom. Unsurprisingly, items such as ‘become a grandparent’, and ‘see my family settled’ reached the top ten most popular responses. However, the most popular activity, with 30% of participants citing it as their top priority, was in fact worldwide travel. The most popular destinations to top the retirement bucket list were Australia, the USA, New Zealand, Canada and China. If you’re over 65 and planning to travel more, Holidaysafe offer affordable travel insurance policies to suit any trip. Our Single Trip policies have no upper age limits, and our Multi Trip policies cover unlimited trips throughout the year for travellers aged up to 79. 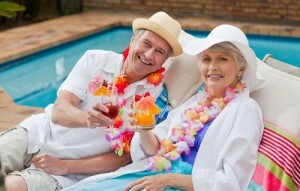 For more information on senior travel insurance, visit Holidaysafe.co.uk.